Last Saturday’s 3-0 defeat at Blyth Spartans was labelled as ‘bordering on embarrassing’ by the Pilgrims manager. But as United prepare to host Darlington today (KO 3pm), Elliott made it clear he believes his squad hurt just as badly as he does when the side loses. “I want to make clear, there’s a lot of good people in that dressing room, a lot of good personalities,” he said. “Don’t mistake playing badly for not caring. I would say there’s a handful of games this season I feel they’ve let you down as fans. “In terms of effort, I don’t mean losing badly, I mean effort. Blyth was one, Peterborough Sports, Chester away, Altrincham at home others. “Yes, they’ve played poorly or misssed a chance. Don’t mistake that for not caring as, trust me, the lads care. “I could give you names, they’re down in the dumps, they’re hurting and they want to do well. “They realise how lucky they are to be here, it’s something I talk to them about a lot. Darlington, currently in 18th, arrive at York Street having won just one of their past four away trips, at basement boys Nuneaton. 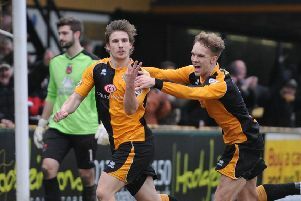 That and Saturday’s home win against struggling FC United are the side’s only victories in their past nine matches. However, they won 1-0 against nine-man Boston in the reverse fixture back in October, following the dismissals of Ben Middleton and George Willis.